David took Michelangelo 2 years to create. 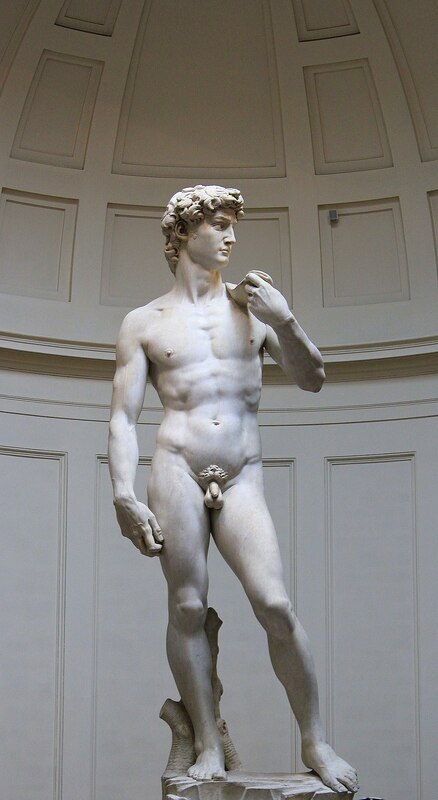 This is the most famous sculpture in the world, and if you don’t recognize it, you probably live under the rock that is David’s foot. This statue is of the biblical hero King David. Besides ruling over the people of Israel, he is best known for giving a beat down to the bully Goliath. Due to the power struggle in that infamous story, this statue is understood as a symbol for the defense of civil liberties. The conception of this work started long before Michelangelo was even born. The Florence Cathedral was to commission twelve statues based off of the Old Testament to enhance their church. Interestingly, Michelangelo is not the only sculptor who chiseled away at this piece of marble. In fact, two other sculptors had worked on this piece before Michelangelo ever laid eyes on the chunk of rock that would soon become the most acclaimed sculpture in the world. Michelangelo was a spry lad of 26 when he took on this gargantuan project, and it took him over two years to create this masterpiece. Legend has it that Michelangelo became so obsessed while creating this sculpture that he slept only sporadically and did so with his clothes and shoes on so that at any moment he could jump up and get back to his beloved David. Clearly his hard work paid off. As giddy as the world is about this sculpture, it turns out you can’t please them all. In 1991, a man went HAM on poor David with a hammer and annihilated the toes on his left foot. Conservators have done a fine job of fastening his appendages back on, but the damage is still noticeable. You may be thinking, wait a tick, I know a thing or two about penises and I am pretty sure that the Abrahamic faiths are not the biggest fans of foreskin. You are correct. So if this sculpture was designed to live inside of a cathedral, why is the blasphemous flesh still proudly affixed to David’s junk? Well, circumcision was different in the time of David as they used to remove only the tip of the foreskin, so it is actually accurate, historically speaking. If you want to have a good chuckle at the expense of David’s dong, check out this SNL skit about the unveiling of this sculpture. Letters were written to him from Florence by some of his friends, saying that he should return, because it was not unlikely that he might obtain the spoiled block of marble lying in the Office of Works, which Piero Soderini, who at that time had been made Gonfalonier of the city for life, had very often talked of having executed by Leonardo da Vinci, and was then arranging to give to Maestro Andrea Contucci of Monte Sansovino, an excellent sculptor, who was seeking to obtain it. Now, however difficult it might be to carve a complete figure out of it without adding pieces (for which work of finishing it without adding pieces none of the others, save Buonarroti alone, had courage enough), Michelagnolo had felt a desire for it for many years back; and, having come to Florence, he sought to obtain it. This block of marble was nine braccia high, and from it, unluckily, one Maestro Simone da Fiesole had begun a giant, and he had managed to work so ill, that he had hacked a hole between the legs, and it was altogether misshapen and reduced to ruin, insomuch that the Wardens of Works of S. Maria del Fiore, who had the charge of the undertaking, had placed it on one side without troubling to have it finished; and so it had remained for many years past, and was likely to remain. Michelagnolo measured it all anew, considering whether he might be able to carve a reasonable figure from that block by accommodating himself as to the attitude to the marble as it had been left all misshapen by Maestro Simone; and he resolved to ask for it from Soderini and the Wardens, by whom it was granted to him as a thing of no value, they thinking that whatever he might make of it would be better than the state in which it was at that time, seeing that neither in pieces nor in that condition could it be of any use to their building. Whereupon Michelagnolo made a model of wax, fashioning in it, as a device for the Palace, a young David with a sling in his hand, to the end that, even as he had defended his people and governed them with justice, so those governing that city might defend her valiantly and govern her justly. And he began it in the Office of Works of S. Maria del Fiore, in which he made an enclosure of planks and masonry, thus surrounding the marble; and, working at it continuously without anyone seeing it, he carried it to perfect completion. The marble had already been spoilt and distorted by Maestro Simone, and in some places it was not enough to satisfy the wishes of Michelagnolo for what he would have liked to do with it; and he therefore suffered certain of the first marks of Maestro Simone's chisel to remain on the extremity of the marble, some of which are still to be seen. And truly it was a miracle on the part of Michelagnolo to restore to life a thing that was dead. This statue, when finished, was of such a kind that many disputes took place as to how to transport it to the Piazza della Signoria. Whereupon Giuliano da San Gallo and his brother Antonio made a very strong framework of wood and suspended the figure from it with ropes, to the end that it might not hit against the wood and break to pieces, but might rather keep rocking gently; and they drew it with windlasses over flat beams laid upon the ground, and then set it in place. On the rope which held the figure suspended he made a slip-knot which was very easy to undo but tightened as the weight increased, which is a most beautiful and ingenious thing; and I have in my book a drawing of it by his own hand—an admirable, secure, and strong contrivance for suspending weights. It happened at this time that Piero Soderini, having seen it in place, was well pleased with it, but said to Michelagnolo, at a moment when he was retouching it in certain parts, that it seemed to him that the nose of the figure was too thick. Michelagnolo noticed that the Gonfalonier was beneath the Giant, and that his point of view prevented him from seeing it properly; but in order to satisfy him he climbed upon the staging, which was against the shoulders, and quickly took up a chisel in his left hand, with a little of the marble-dust that lay upon the planks of the staging, and then, beginning to strike lightly with the chisel, let fall the dust little by little, nor changed the nose a whit from what it was before. Then, looking down at the Gonfalonier, who stood watching him, he said, "Look at it now." "I like it better," said the Gonfalonier, "you have given it life." And so Michelagnolo came down, laughing to himself at having satisfied that lord, for he had compassion on those who, in order to appear full of knowledge, talk about things of which they know nothing. When it was built up, and all was finished, he uncovered it, and it cannot be denied that this work has carried off the palm from all other statues, modern or ancient, Greek or Latin; and it may be said that neither the Marforio at Rome, nor the Tiber and the Nile of the Belvedere, nor the Giants of Monte Cavallo, are equal to it in any respect, with such just proportion, beauty and excellence did Michelagnolo finish it. For in it may be seen most beautiful contours of legs, with attachments of limbs and slender outlines of flanks that are divine; nor has there ever been seen a pose so easy, or any grace to equal that in this work, or feet, hands and head so well in accord, one member with another, in harmony, design, and excellence of artistry. And, of a truth, whoever has seen this work need not trouble to see any other work executed in sculpture, either in our own or in other times, by no matter what craftsman. Michelagnolo received from Piero Soderini in payment for it four hundred crowns; and it was set in place in the year 1504. David is a masterpiece of Renaissance sculpture created in marble between 1501 and 1504 by the Italian artist Michelangelo. David is a 5.17-metre (17.0 ft)marble statue of the Biblical hero David, a favoured subject in the art of Florence. Check out the full Wikipedia article about David (Michelangelo).